Pictured are the representatives from the crofting townships who are determined to take the fight for their own wind farm development all the way. Plans for the first large-scale wind farms to be built on the Isle of Lewis took a step nearer realisation this week as the Scottish Land Court announced dates for preliminary hearings of the case for the development on crofting land. Developers on both sides of an increasingly bitter legal dispute over who should have the rights to develop the wind farms welcomed the announcement, and both sides will have their cases heard at the Court in Stornoway in December. Lewis Wind Power (LWP), a partnership between multi-national energy company, EDF, and Wood Group, that is working closely with land-owner, The Stornoway Trust, will have its plans before the Scottish Land Court. But at the same sitting the Court will also take a preliminary hearing of the plans of the four crofting townships that want to build their own wind farms on common grazings which, in three out of four locations, already form part of LWP’s proposals. The crofting townships of Sandwick North Street, Melbost and Branahuie, Sandwick East Street and Lower Sandwick have developed plans for wind farms on four sites on the Pentland Road, outside of Stornoway, but their plans are opposed by The Stornoway Trust, and earlier this year the Townships lost three of the four cases they took to the Crofting Commission in a bid to gain the right to develop the sites. The Commission concluded that the development would be detrimental to the interests of the land owner and should not proceed. However the Townships hailed aspects of the Commission’s rulings claiming that the right in principle for crofting townships to develop energy projects on common grazing lands had been established. They vowed to continue their fight to secure the right to develop the land through an appeal to the Scottish Land Court aimed at over-turning the Crofting Commisson’s conclusion. The Township’s appeal has now been lodged with the Courts, but no date has been set for the appeal hearing, and it remains unclear as to how the Land Court’s hearings will progress whilst the Township’s appeal remains unresolved. Commenting on the announcement of the Scottish Land Court dates, Will Collins, LWP Project Manager, said: “The Stornoway Wind Farm would be located across a number of common grazings and we are required to obtain approval from the Land Court in order to protect the interests of the crofting community. The hearing next month is simply the latest stage in this process which has been followed by a number of other wind farm developments. “LWP’s application being considered by the Land Court provides for payments to crofters in recognition of the limited impact on access to a small proportion of the overall grazings, and the Court’s role will be to assess the fairness of the package we have developed. Will Collins also claimed that ‘80 per cent of those who were entitled to object’ to its plans, raised no objection. He concluded: “In addition to our Land Court application we are working closely with the Comhairle and the democratically-run community landlord, The Stornoway Trust, to ensure a significant community shareholding in the Stornoway Wind Farm and our Uisenis Wind Farm. But the Township developers have disputed that LWP’s plans will deliver the best returns for the community. The Townships are seeking to develop 21 turbines, and their spokesperson this week claimed that their scheme would be ‘‘economically preferable’ as ‘community-owned projects return 20 times as much money to the local area as do private projects’. Last week The Stornoway Trust claimed that the LWP project was the ‘only viable scheme’ if plans for an inter-connector cable, transporting energy to the mainland from the wind farms, were to proceed, and The Trust also claimed that ‘piece-meal’ developments by crofting townships would not be able to deliver the economic case for the inter-connector. The Trust’s claims were vehemently denied by the Township developers. In a statement issued this week, the Townships asserted that: ‘the convergence of these two planning applications before the Land Court, and the fact the hearing will examine who has the right to develop on crofting land – a private company given a lease by a landowner or the crofting shareholders of the common grazings – means this is being widely regarded as a test case for crofting rights across the Highlands and Islands’. Rhoda Mackenzie, spokesperson for Sandwick North Street, stressed what the townships were fighting for was ‘control of the profits for the good of the whole of the Outer Hebrides’. Rhoda MacKenzie concluded: “It’s our land. It’s our grazings land and it’s been taken off us. It’s community land ownership in reverse. In the Township’s statement, Kenny Morrison, a representative from Sandwick East Street and Lower Sandwick, said: “If the Stornoway Trust had only come and talked to us at the outset away back, a lot of this would have been avoided. The Stornoway Trust also rejects any suggestion that it has not communicated with the crofters concerned, citing a total of 72 public and consultation meetings, and meetings with individual grazing committees. Mr MacIver continued: “We are disappointed that the language used around this issue has been so divisive on the part of the four townships and their spokespeople. “They persist in referring to themselves as ‘the crofters’, but there are many others who would claim that label – including Stornoway Trustees – who fully support the LWP project. “Feelings are evidently running high. 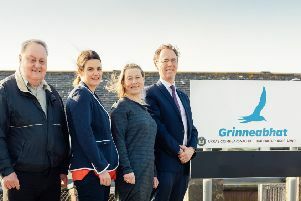 However, SSE has submitted its needs case for the inter-connector, based on this [the Stornoway Find Farm] project, and the other LWP wind farm at Uisenis, and that will provide the community with spare capacity to progress their own developments. There is every reason for the community to be optimistic about the future. “Lewis Wind Power has the lease, planning consent and grid connection, and is ready to bid in the Contract for Difference auction early next year. The Scottish Land Court hearings will take place in Stornoway on 12 and 13 December in the Rev MA Macleod Memorial Hall on Kenneth Street, Stornoway and hearings will begin at 10am on each day. On 26 and 27 November the Township developers are also holding a public consultation In Stornoway Town Hall over their initial planning applications lodged with Comhairle nan Eilean Siar.